A few releases ago OS X introduced scroll acceleration, which means if you keep scrolling in some direction, the speed of the scroll will be greater and greater. You cannot disable this from the UI. It is extremely annoying if you want to scroll through a long website or a long source code in an editor. 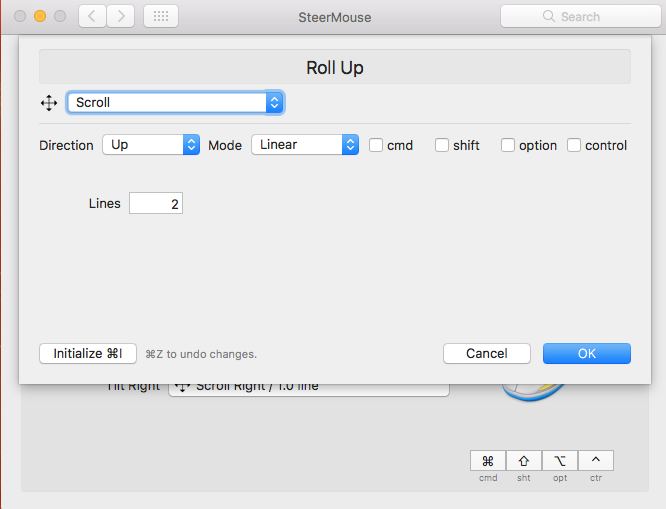 Until macOS Sierra you could disable this using DisableExtremeScrollAcceleration tool. But this tool is no longer working. Is there any way to prevent the scroll acceleration? You may download a binary here. It runs in the background and allows you to scroll 3 lines with each tick of the wheel. 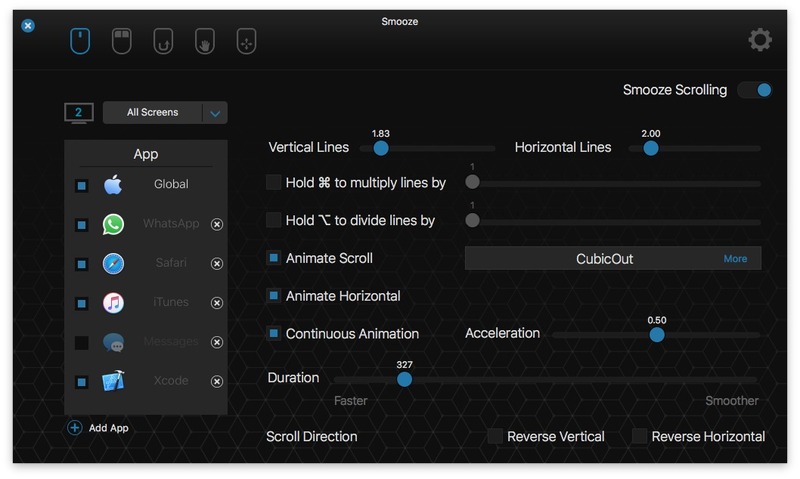 toggle the "Animate Scroll" to Off and you're good to go. Try USB Overdrive. I was having the same problem as you and this fixed it. It works with MacOS Sierra. I found the "fix" for my Logitech mouse. Select your mouse and click "configure". I also had an issue with my back/forward buttons. Within the same control panel, I had to reconfigure them as "key strokes" of "cmd + left arrow" and "cmd + right arrow". Edit: Logitech released an updated version of their control center, which fixes the issue. 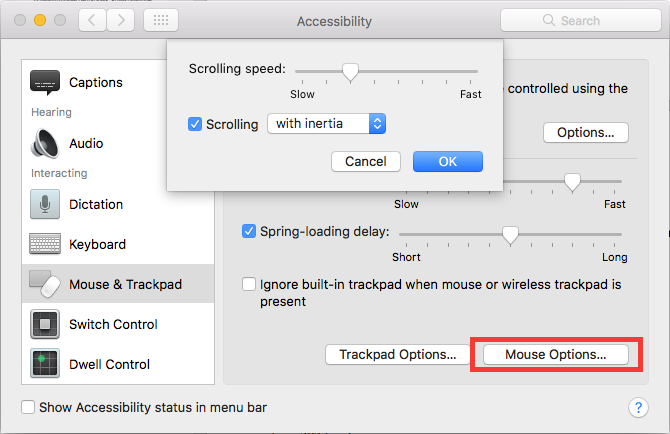 macOS Sierra introduced a scroll wheel deadzone where input would be ignored unless you scrolled at a minimum speed. Scrolling the wheel one notch at a time would not produce any movement on the screen. This deadzone made people scroll the wheel faster than before, thus hitting the acceleration threshold even faster (though it's always been there). The scroll wheel deadzone has been removed in the 10.2.2 public betas. With defaults write .GlobalPreferences com.apple.scrollwheel.scaling -1, there should be no scroll wheel acceleration in apps (that use native scrolling). 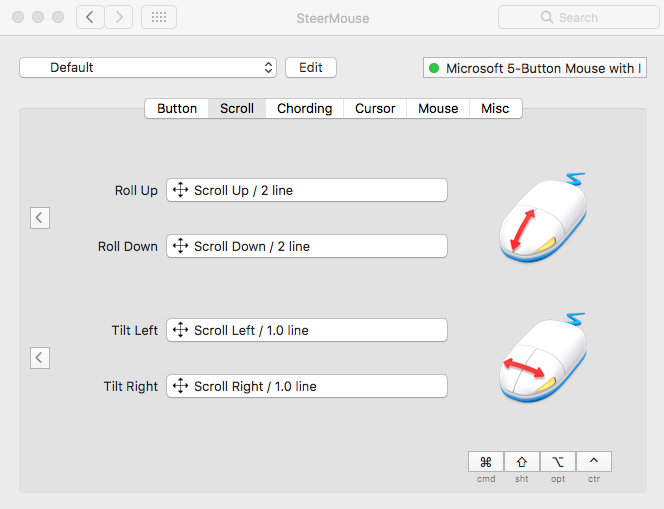 Alternatively you can use SteerMouse. I've been using this for a few years. It costs $20, but for me it was worth it. Default mouse acceleration settings always annoy me. Open it up via System Preferences -> SteerMouse. Click 'Roll Up, and in the next dialog choose Mode = Linear. Do the same for 'Roll Down'. Not the answer you're looking for? Browse other questions tagged mouse scrolling sierra .